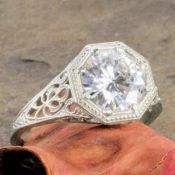 Description: Reminiscent of the 1920's Art Deco designs. 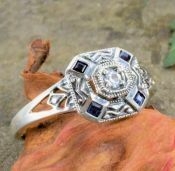 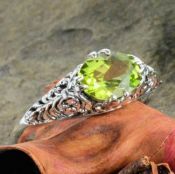 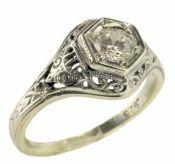 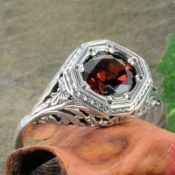 We are pleased to offer this line of high quality vintage inspired sterling silver filigree Jewelry. 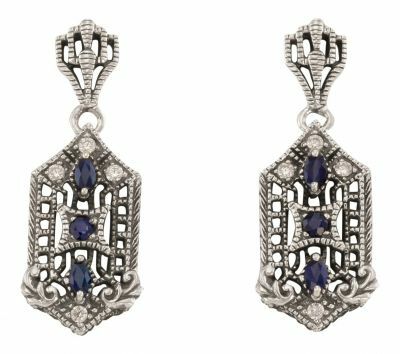 Each earring features two 3.0 x 2.0mm marquise cut and one 2.0mm round cut genuine sapphires with cubic zirconia accents.� The design is intricate with embossed details that are highlighted by a lightly antiqued finish. 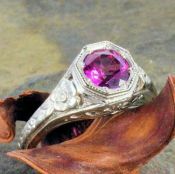 Suspended on post with friction backs.